The North Georgia Candy Roaster Squash also referred to as the Candy Roaster Squash is known for its sweet flavor hence the word, “candy” in the name. This variety has a history native to the areas surrounding the Cherokee tribes of North Carolina, Georgia and Tennessee. 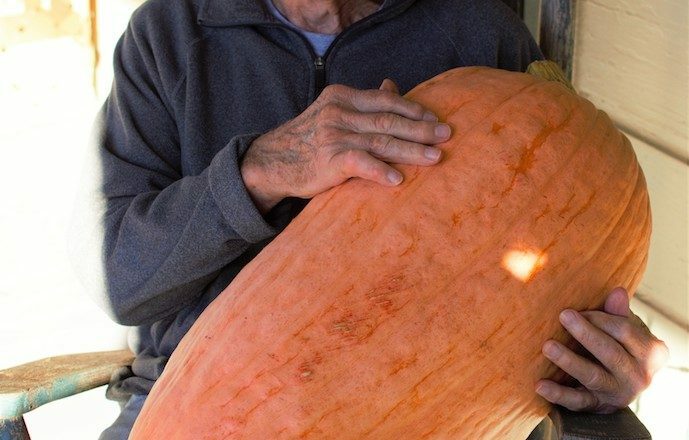 The Cherokee tribes of the Southern Appalachian regions first savored this squash because of its ability to withstand the harshness of a winter frost and because of the long shelf life. In fact one of the delicious qualities of the candy roaster squash is the fact that after the vegetable has sat for several months the sweet flavor will reach its full potential right in time for a warm soup during the cold months or a pie for the holidays. This fun plant can grow to a weight range of 10-250 pounds! Just check out the photo above from one of our board members and her Dad. Stories have even been told that an effective method for getting inside to the sweet flesh of the squash is to simply drop it on hard ground and watch it bust in pieces. Collect the pieces and roast. Did the Cherokees do it this way? Possibly. We hope to find out in our research. The candy roaster squash is still planted in the Cherokee tradition of the “Three Sisters.” This strategy is done by planting the squash at the base of the corn and bean stalks. The large leaves of the squash help to keep the soil moist and prevent weeds from growing. Due to the large leaves and vine of this variety, space can be an object. Be sure to dedicate plenty of space and even a trellis for growing this variety. Today the availability of these squash seeds is a concern. The fact that this plant is open pollinated means that it can cross pollinate with other cucurbita maxima within a distance of up to 1 mile. In order to protect the biodiversity of the candy roaster squash, one needs to plant away from other squash to minimize the chances of accidental cross pollination. 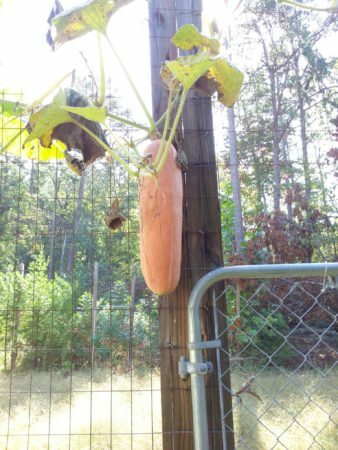 Slow Food Asheville is proud to focus on this rare and interesting squash variety for the 2018 heritage food project. In October we will host a celebration event where all gardeners, growers and supporters of the heritage food project are invited to eat this sweet squash in many dishes and share our stories so that we can play our part in preserving this heirloom variety and in making history…slowly.